Russian researchers from the Moscow Institute of Physics and Technology (MIPT), the Technological Institute for Superhard and Novel Carbon Materials (TISNCM), and the National University of Science and Technology MISIS have optimized the design of a nuclear battery generating power from the beta decay of nickel-63, a radioactive isotope. 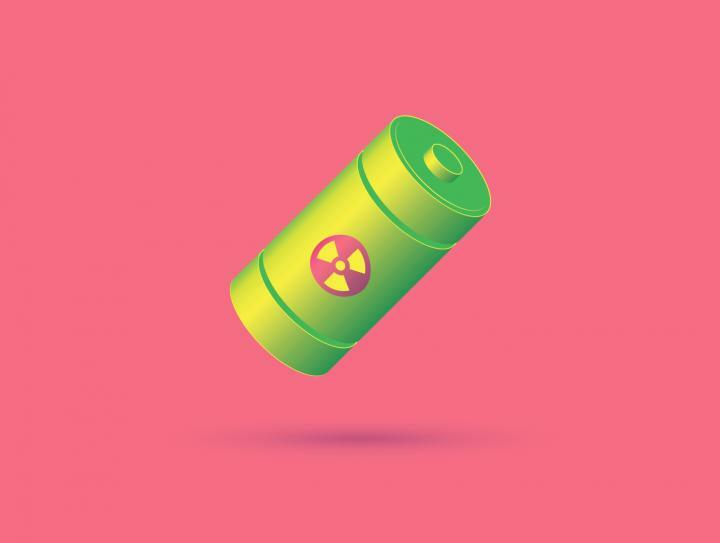 Their new battery prototype packs about 3,300 milliwatt-hours of energy per gram, which is more than in any other nuclear battery based on nickel-63, and 10 times more than the specific energy of commercial chemical cells. The paperwas published in the journal Diamond and Related Materials. In 1953, Paul Rappaport proposed the use of semiconducting materials to convert the energy of beta decay into electricity. Beta particles — electrons and positrons — emitted by a radioactive source ionize atoms of a semiconductor, creating uncompensated charge carriers. In the presence of a static field of a p-n structure, the charges flow in one direction, resulting in an electric current. Batteries powered by beta decay came to be known as betavoltaics. The chief advantage of betavoltaic cells over galvanic cells is their longevity: Radioactive isotopes used in nuclear batteries have half-livesranging from tens to hundreds of years, so their power output remains nearly constant for a very long time. Unfortunately, the power density of betavoltaic cells is significantly lower than that of their galvanic counterparts. Despite this, betavoltaics were in fact used in the '70s to power cardiac pacemakers, before being phased out by cheaper lithium-ion batteries, even though the latter have shorter lifetimes.